Coat, hat, gun. The guts of crime noir. Plots may change, but there’ll always be these things. And broads, of course. It’s all here in Don Siegel’s 1968 crime thriller Madigan. In a botched assignment, police detective Dan Madigan (Richard Widmark) and his partner lose both their guns and a wanted criminal. The new Police Commissioner (Henry Fonda) isn’t too happy about this, so orders them to get the guns – and the convict – back within 72 hours. All the while, Madigan is struggling with his socially and sexually frustrated wife, the departure of his mistress and police brutality accusations. He’s a busy guy. 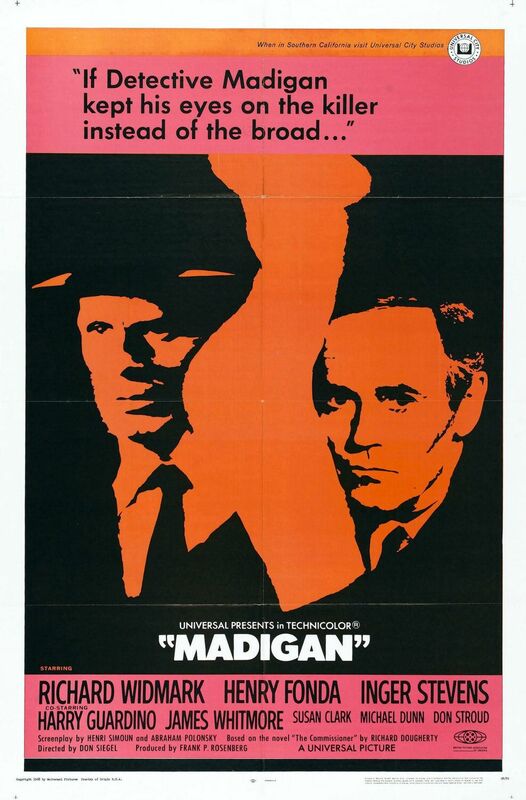 Madigan is a ‘60s man’s world, and the poster perfectly captures this. Aesthetically, it’s a classic late pulp screen print, in the red and black colourway characteristic of ‘60s noir and horror poster designs. Stylistically, it mimics the iconic Saul Bass creations (Psycho, Anatomy of a Murder), and despite its bland typography, is an excellent example of a ‘60s pulp artwork – and an excellent lead-in to the film, with everything you need to know: coats, hats, guns… and broads. Madigan is out now on DVD via Screenbound Entertainment.